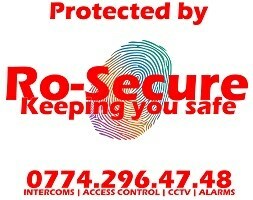 RO SECURE is a company made to provide customers with safety options and secure services at all times. Our engineers are professionals with over 6 years of experience in the industry. Trained to deliver the best customer experience and work as tidy and neatly as possible. With the help of RO SECURE you will get the best advice on what is the best service for you. RO SECURE will help you protect your home & family ,retail store, office or business with CCTV Cameras, Intercom Systems, Intruder Alarms etc. so please don't hesitate to call us for a free quote.